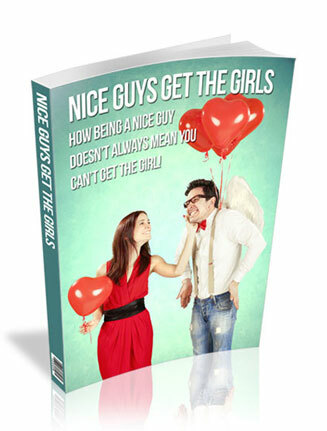 Nice Guys Get The Girls PLR Listbuilding and Email Messages includes all you need with pre written PLR autoresponder messages a give away report and private label rights to put your name on it. 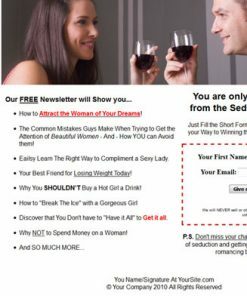 I’m sure i don’t have to tell you how huge and how highly profitable the dating niche is. It’s a multi-million dollar market and it’s world wide. You know that this group of people is more than willing to spend dollar after dollar if they think it will bring them closer to the love of their life. We see the dating commercials on television every day because it’s big money with a large customer base. It is also a evergreen niche, meaning there will ALWAYS be people needing help to find love. Here is your golden opportunity to grab your share of a high profit niche full of buyers. You’ll be getting not only a complete listbuilding package, but all the autoresponder messages to send to your new subscribers. It’s a income stream in a box. Give-Away Report – Brand new and hot off the presses, we just finished this one. It’s a high quality with a professional layout and look. It comes in editable format, so you can change it any way you’d like. Squeeze Page – Custom made just for this product, it’s almost ready to go out of the box. Simple copy and paste your opt-in code and it’s ready t build you a list on automatic. Confirm page – If you use double opt-in in your email marketing, this page will encourage your new subscribers to verify their email address. This could mean a much bigger list to promote to. Download page – Just add your download link, upload and your done. Best yet, the page comes with a related clickbank ad already built into the page for you. Your visitors trusted you enough to give you their email address, so they are more likely to buy what your selling. With this feature, You could be getting paid to build your list. Pre-Written Autoresponder Messages – 22 quality email messages that have already been created for you. 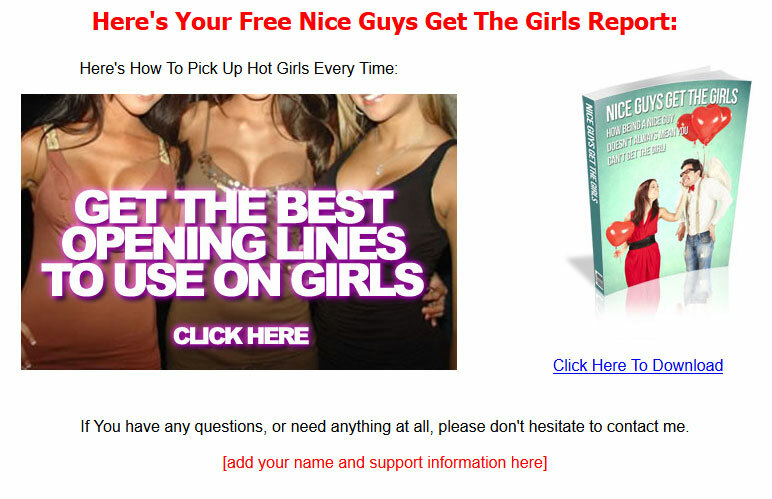 This messages are a mixture of content and promotion and every one has a dating related clickbank link. So you have the potential to make money with every message sent. New eCover – We also created a brand new eCover just for this product, completely from scratch. It’s something you won’t find anywhere else but here, so grab it quick to have the exclusive. Cover PSD – Want to edit change the cover? No problem, with the PSD you can easily change it however you want. Brand it with your name, website, what ever you want. 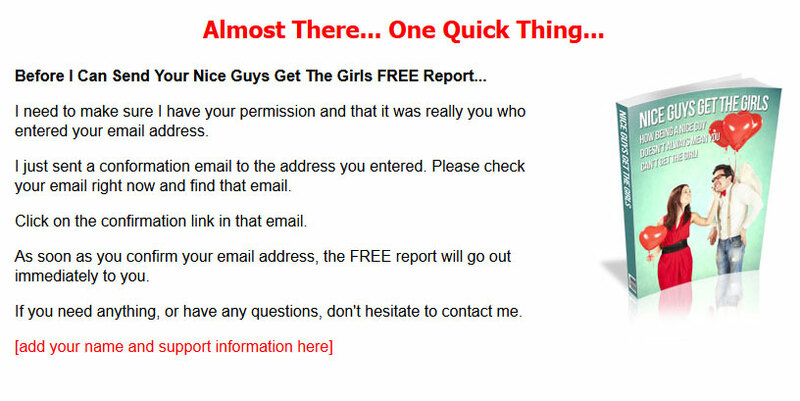 Give away report is quick and to the point. Gives your subscribers just enough to want more, more being what your promoting. It has quality content with over 3,100 words of information your readers will love. Report comes in both Word DOC and Open Office format, so you know it’s easy to edit or change it to suit your needs. It also has a linked table of contents and proper page numbering. You’ll look like the professional and better be seen as an expert or authority. The pre-written autoresponder messages come with over 8,000 words, your sure to to hook your subscribers by providing some useful content. As mentioned the messages are a mix of content promotion and every message comes with a clickbank promotional link. Just add your clickbank affiliate ID and you get credit for all the sales. Is looking good important to attracting women? Do you know that special lady in your life? Do You know exactly how women see the world? What kind of woman do you want? Where can you meet a potential girlfriend? 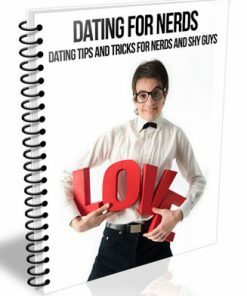 Getting A Girlfriend – Can Geeks Find Love? Set the Bait and Let Her Come to You! …And I thought I knew it all! Moment to moment seductive tactics revealed! Messages come in both Word DOC and plain TXT format so they are simple to use. We also made it easy and quick to customize each and every one of them. It takes only a couple minutes to edit the greeting, salutation, name and website. Message promote 5 different clickbank related programs, so you have five different opportunities to cash in. Think there is some money to be made here? You bet! The autoresponder messages are also pre-formatted to 65 characters or less, the recommended width for most autoresponder services. This saves you a ton of editing time, it’s already been done for you. Each message comes with a closing hook, which hints at what’s coming in the next email. This can help to keep your subscribers looking forward to, and opening your future emails. As we know, the more they open, the better chance you have of making sales. Takes a couple minutes to customize the messages, copy and paste them into your autoresponder service and it’s ready to run for you on autopilot. 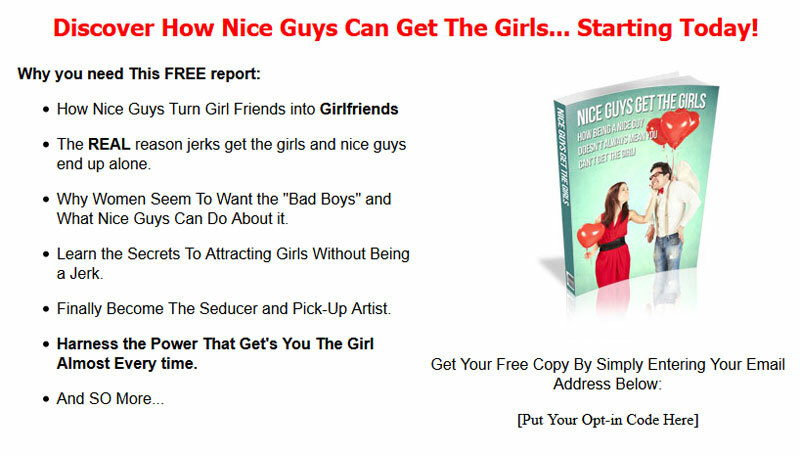 This Nice Guys Get The Girls PLR Listbuilding and Email Messages package is simple to use and only a few steps to have it up and running for you. Not only building a list but sending out promotional emails for you. Copy and paste your opt-in code into the squeeze page. Add your give away report download link to the download page. Edit the report to your liking. Upload the web pages to your website. Copy and paste the email messages into your autoresponder service. Build a list and make money. Prefer to Login with Social Media? NOTE: If you already have an account with us, you will need to login to your account and then you can link your social account under account details. By creating an account with our store, you will be able to move through the checkout process faster, view and track your orders in your account and more.